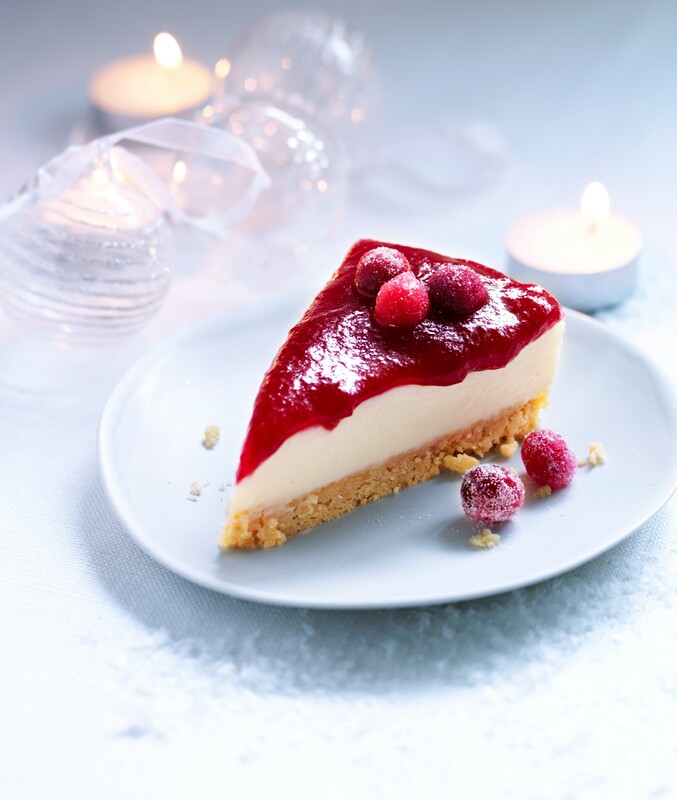 This quick setting light textured cheesecake is the perfect answer to an alternative to the richness of Christmas pudding… the fruity cranberry coulis cuts through the soft and creamy filling and the buttery shortbread. Happy Christmas! 1. Crush the biscuits in a blender or in a double lined bag with a rolling pin. Mix together the crushed biscuits and melted butter then lightly press into the tin. Chill while you make the filling. 2. Beat the condensed milk and cream cheese together until completely smooth. Add the lemon juice and combine thoroughly – the mixture should thicken. Spread the creamy filling over the base. Chill for 4 hours. 3. Tumble the berries into a small pan with the sugar and 100ml (3fl oz) water, cover and simmer for 5 minutes until the berries are soft and pulpy. Push the mixture through a sieve and chill the cranberry coulis until ready to serve. 4. Remove the cheesecake from the tin and place on a serving plate. Gently pour the cranberry coulis over the cheesecake, spreading out to the edges to serve. Add a sprinkling of ground almonds to the biscuit base or use different biscuits for this recipe – try dark chocolate chip cookies or digestives. This cheesecake sets perfectly without the need for gelatin thanks to the natural setting effect of lemon juice on condensed milk. Oh yummy. Cheesecake is one of my all time favourite treats 🙂 Thanks for linking up to the Wednesday blog hop. ooo wow so this looks really yum!!! Very Christmassy! I’m in the spirit now.